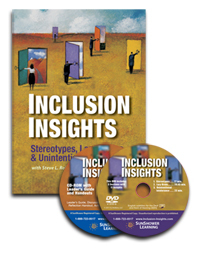 This best-selling training video program shows how the creativity and innovation approach to Diversity & Inclusion works by seeking different perspectives, new ideas, knowledge and experiences. Examine how nice, well-meaning people engage in "unintentional intolerance. Section 1: Stereotypes 27 min. Insight 1: Don't judge a book by its accent ..... 5:50 min. Insight 2: N.I.C.E. people ..... 7:30 min. Insight 3: The Power of Culture ..... 9:40 min. Section 2: Lazy Brains 20:45 min. Insight 5: Lazy Brains ..... 5:15 min. Insight 6: The Role of Visual Cues ..... 2:30 min. Insight 7: Cognitive Dissonance ...... 9:40 min. Insight 8: Flat Out Wrong ..... 3:20 min. Section 3: Unintentional Intolerance 23 min. Insight 9: Unintentional Intolerance: How NICE People Make Mistakes .....9:45 min. Insight 10: Unintentional Intolerance in Action ..... 9:00 min. Video Streaming - We offer licenses that make it easy for you to stream this program. Just call and we can show you how easy it is to stream Ouch on your LMS or ours. You can purchase streaming for 100 and 250 trainees right here on the site. We'll send you instructions for how to access the streaming video on our LMS. UBS Flash Drive with Videos & Training Material - This program is also available on USB Flash Drives (USB stick). This is a useful innovation because so many laptops no longer have DVD drives! The USB Flash Drive will work with any system, PC or MAC, and requires no special software. It’s all included on the Flash Drive. Insert the stick into your USB slot, click to open the folder, click on the video and off you go to play the video. The full training program comes with no matter which format you choose. So, this includes the video and all the training materials, handouts and Powerpoints. Excellent diversity and inclusion program.